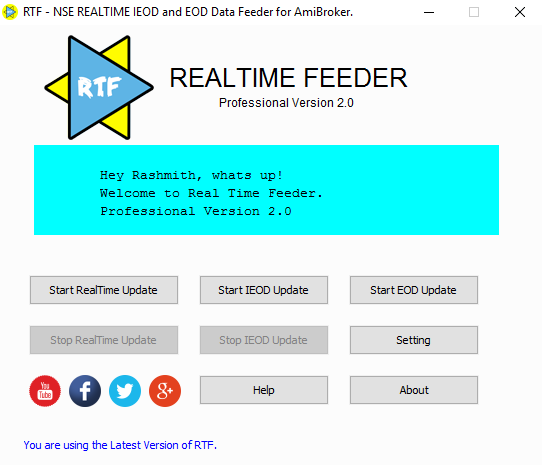 So Finally after a long wait and a lot of expectations, we present you the REAL TIME FEEDER (RTF) a utility to get and update Real Time, IEOD and EOD data to the best charting software Amibroker. 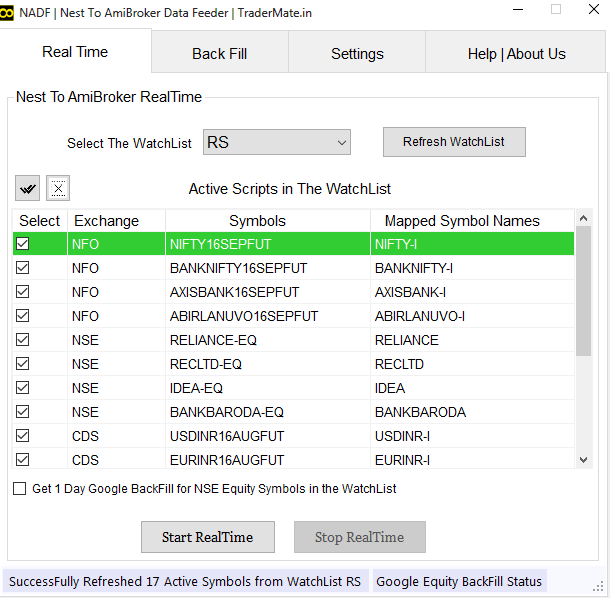 RTF simplifies the process of getting data and updating it to the Amibroker and hence helps you to concentrate only on your trading strategies. The Real Time data is taken from your Trading Terminal through the excel and hence the RTF will reduce your Internet data charges by a quite good margin. You can try the RTF software for 10 days with some limited features and if you feel that RTF is for you then you can get the RTF PROFESSIONAL version for a onetime small Remuneration fee and use the RTF for life time (No Monthly plans nothing. Just one time fee). Works on both 32 bit and 64bit OS. Real time data backfill facility available. RTF downloads and Auto updates IEOD data of National Stock Exchange India to Amibroker. Maximum of last 7 days data available with minimum of one minute interval and 60 days data in 5 min format. RTF downloads and auto updates EOD data (Equity & Futures) of National Stock Exchange India. Downloaded data will save as text file (ASCII format) so user can use it further. EOD Last 7 days Data As much data provided by NSE (current year data only). You can pay the Remuneration Fee for our work using your credit card / debit card or net banking facility and get RTF Professional Version. NOTE : You Should Provide a GMAIL ID while paying for the RTF(where you have to enter your email id).